After you buy the plugin, you should receive an email receipt from Nose Graze. This email will contain a link to download a .zip file containing the plugin. 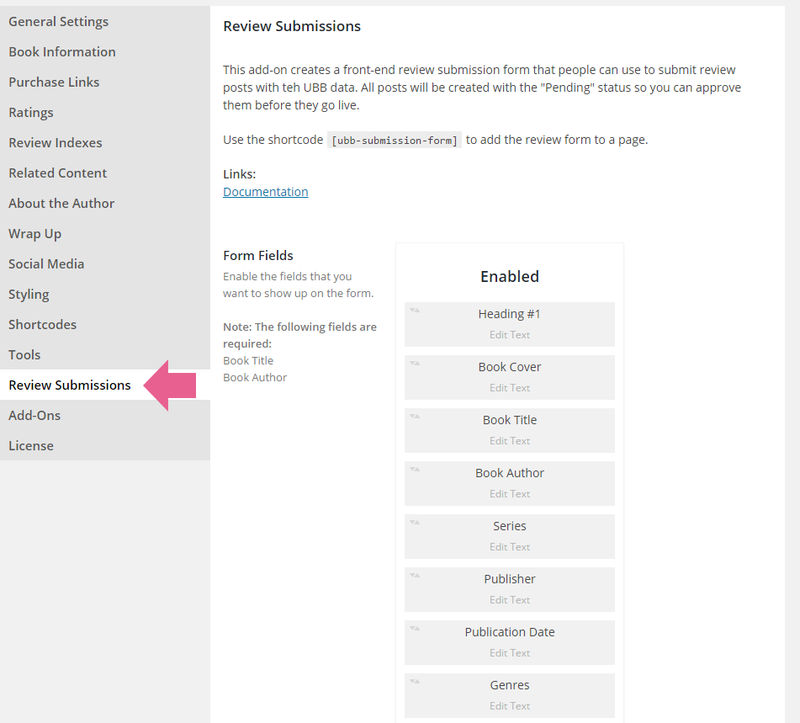 Once you have the zubb-review-submissions.zip file downloaded, login to your WordPress site. If you wish to enable automatic updates, you need to enter your license key. To do this, navigate to Ultimate BB » License. You'll see a new box there specifically for the Review Request License. Enter your key there and press "Save Changes". When the page reloads, you will need to click the Activate button below your license key. The key will not be activated until you click that button! The settings for the Review Request add-on are located in Ultimate BB » Review Submissions. This is where you can configure the form fields and other settings. The first thing you should do is decide which fields you want to appear on your submission form. You can do this by configuring the settings in Ultimate BB » Review Submissions. There’s a drag and drop interface for enabling and disabling form fields. You must have these fields in the "enabled" column. This will insert the form. In the settings panel, you are asked if you'd like to "Create Accounts for Reviewers". By default this is set to "no". If set to "no", then people submitting reviews do not get their own WordPress account. Instead, you choose from a dropdown which account you'd like to be automatically assigned to all submissions. The reviewer doesn't necessarily have access to this account. So, for example, you might create an account called "GuestReviewer". No one has access to this account, but all guest reviews are published under this account to separate those reviews from yours in the admin panel. 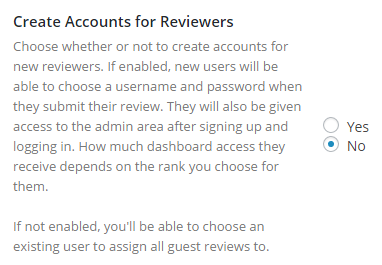 Unless you choose to manually create an account for your reviewers, they are given no admin panel access at all. 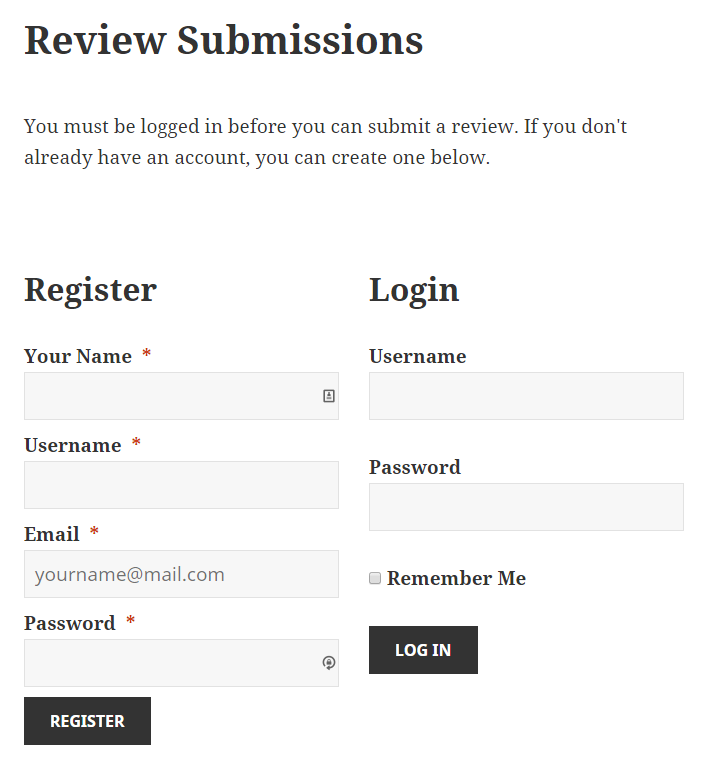 However, if you choose YES, you want to create accounts for reviewers, then they are asked to register a WordPress account on your site before they can submit a review. They need to register a new account (on the left) or login to an existing account (on the right) before they can access the Review Submissions form. You can choose the rank the reviewer's account is assigned to so you can limit their access. You can manually change this later on a per-user basis by editing their user account in the "Users" tab.